Metallica have released a video showcasing their acoustic version of their 1986 track Disposable Heroes. 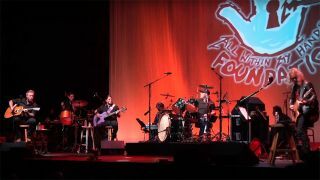 The song will appear on the band’s upcoming album Helping Hands… Live & Acoustic At The Masonic, which was recorded early last month, with the event organised in aid of their All Within My Hands Foundation. The record will launch on February 1 on limited edition 140g coloured vinyl through independent record stores. Proceeds will be donated to All Within My Hands, with the release spread over two discs and was mixed by Greg Fidelman and mastered for vinyl by Reuben Cohen at Bernie Grundman Mastering. The album will also be made available through digital and streaming platforms. The acoustic performance was the culmination of a charity auction, with the band previously checking in to say that they raised $1.3 million. Metallica will return to the UK and Europe on the next leg of their WorldWired tour from May next year.